Thousands of years hence, many races inhabit auniverse where a mind’s potential is determined by its location in space, fromsuperintelligent entities in the Transcend, to the limited minds of theUnthinking Depths, where only simple creatures and technology can function.Nobody knows what strange force partitioned space into these “regions ofthought,” but when the warring Straumli realm use an ancient Transcendentartifact as a weapon, they unwittingly unleash an awesome power that destroys thousandsof worlds and enslaves all natural and artificial intelligence. Fleeing the threat, a family of scientists,including two children, are taken captive by the Tines, an alien race with aharsh medieval culture, and used as pawns in a ruthless power struggle. Arescue mission, not entirely composed of humans, must rescue the children-and asecret that may save the rest of interstellar civilization. Ihave wanted to read A Fire Upon the Deepfor some time now. It’s been heralded as a SciFi classic and Vernor Vingeis a name I’ve seen passed around with a good deal of respect. However, untilTor sent me The Children of the Sky,I forgot to read A Fire Upon the Deep.Thankfully, that has been remedied. A Fire Upon the Deep is, perhaps, one ofthe most inventive science fiction books I have read. In fact, it’s soinventive that my mind boggles as to how Vinge managed to not only create itall, but to keep it as realistic as it ended up being. Vinge keeps his universedetailed without becoming overbearing with it. While it did take some time tofully understand some aspects of the universe (like the different levels, forlack of a better word, of space), this didn’t hamper the overall flow, orunderstanding of this book. However,to make this book work, Vinge had to use a few plot devices which don’t reallystand up to close examination. For example, the alien world can convenientlysupport human life, and the Tines who live on this world can mentally andverbally interact with humans. Furthermore, the creatures in the Blight, whoare much further advanced than humans do seem incredibly human. Though,generally speaking, this can be overlooked as the book as a whole is soenjoyable that most flaws can easily be forgiven. Thenew and unique ideas in A Fire Upon theDeep deserve to be mentioned. While they do occasionally push the plot tothe back burner, the unique aspect of Vinge’s universe is worth reading thisbook for. For example, the Tines are an incredible alien race who can “hear”thoughts and need to work as a pack of multiple members to function on a humanlevel. These wolf-like creatures are quite incredible and stole the limelightwhenever they entered the book. Thereare multiple characters in A Fire Uponthe Deep, some more engaging than others, but they are all interesting tolearn more about and follow through the events that take place. However,despite how enjoyable the characters are, some of them fall into depressingstereotypes, like the villain, Lord Steel, who’s “evil” nature seems to be hisonly defining characteristic, and has a master plan which he spends much of thebook doing behind the backs of pretty much everyone. Another stereotypicalplotline is the orphaned kids left on an alien world split between two warringrulers. While this didn’t bother me as much as the first that I mentioned, itis worth mentioning. Lord Steel, when stood against the unique ideas and tightwriting in the rest of the book, sticks out like a sore thumb. Whileit may sound like I only moderately enjoyed this book, the truth is that Iabsolutely loved it. A Fire Upon the Deepis an incredibly enjoyable read made only better by Vinge’s flowing and descriptivewriting which he somehow manages to keep from being overbearing in the face ofeverything he is creating, defining and exploring with the reader. And thewriting is only helped by the plot, which can, at times, be rather uneven, butstill, despite the stereotypes it trips on, manages to be one of the mostinteresting plots in a science fiction book I’ve had the honor to read since Istumbled upon Peter F. Hamilton. 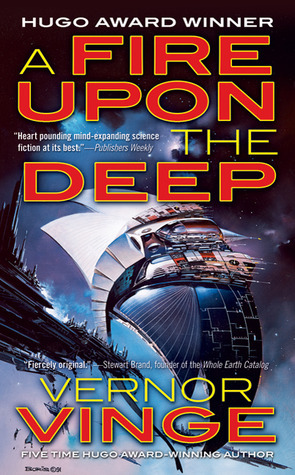 A Fire Upon the Deep is one of thoserare books that seems to have as many flaws as it does strengths, but they canall be easily overlooked in the face of the sheer enjoyment a reader can findwith Vinge’s writing, world building and plot. A Fire Upon the Deep in unique and refreshing. There isn’t anythingquite like it, and for that reason alone it’s well worth checking out. Great review! I've never read anything by this author and have been wondering if I should (based on all the fuss that's been made over his new release). I'll have to move his name onto the the "definitely try" list. I should add it on my list.